Polycell Quick Drying Polyfilla Spray offers a unique application method within the Polyfilla range that makes repairing hairline cracks and minor surface imperfections on smooth interior walls fast and easy. 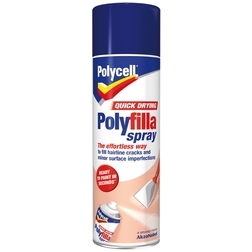 The Polyfilla Spray has been specially developed to provide a less-mess formulation – simply spray it on and smooth off. Please read the instructions carefully to ensure best results. Fast and effortless application – simply spray on & smooth off. Ready to paint in 2 minutes. For hairline cracks and minor surface imperfections. For use on all types of smooth interor walls.